So you might have recently found out about One Fat Frog doing a quick-ship program for walk-in fridges and walk-in freezers. But unlike your run-of-the mill fridges and freezers, walk-in units are a completely different story. It’s not like your 48-inch reach-in where it’s just a matter of whether you want this fridge or not. Here are (at least) five things you need to know if you are considering a walk-in freezer or a walk-in fridge. And a disclaimer: This is just a general guide if you’re considering a walk-in. This guide does not necessarily reflect the inventory of One Fat Frog. 1. Consider the Type of Refrigeration. 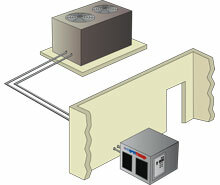 In the cooling and the freezing world, there are two types of refrigeration: Remote and Self-Contained. Remote refrigeration, or having a remote condenser, means that the physical walk-in unit may be in your kitchen (or wherever you’re assigning the unit within your establishment), but the actual condenser and the compressor might be placed in another room or outside. Because they’re connected separately, you won’t have to worry about making your kitchen hotter, and generally opening up some space in your unit. Source: OmniTemp. This is an example of an industrial A/C unit with a remote condenser by the way. Notice how the lines between the actual unit and the condenser have wiring that involves drilling holes in the walls. 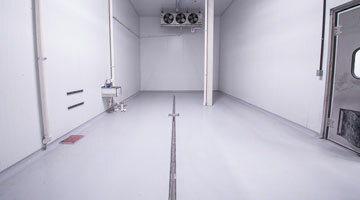 But because there’s more work to separate the walk-in and the condenser, remote walk-ins are typically more expensive. And unlike Self-Contained, harder to service. Since separate and more-complex wiring will be required to connect the two together, you’ll more-than-likely need a professional to install a unit for you. And if you haven’t realized it by now, you’ll likely have to buy a condenser separately. And then there’s the self-contained refrigeration. As the title might suggest, the condenser and the compressor is built-in to the unit itself. This means you typically have greater control of not only where you want to place the walk-in, but installation will be easier as well (and possibly do it yourself). As this is typically less-expensive to produce, self-contained units of any kind are typically more available. But be prepared to have a hotter kitchen as the condenser and the compressor does the work. And since the cooling motors are all within the unit, it’ll likely bring up the noise levels within your kitchen/area as well. And depending on your unit, you might have to give up some more space compared to a remote condenser unit. There are actually many other kinds of refrigeration available, but the two mentioned above are typically the most common. While you might be intentionally buying a bigger walk-in to accommodate future needs, seriously consider how realistically big your walk-in should be. As a general rule of thumb, 1 cubic feet can hold about 28 pounds of food. And if you’re not doing custom-built walk-ins, you also have to consider the fact that walk-ins that are not custom-built come in limited sizes. Usually most walk-ins have their own floor. This is necessary in most cases to localize the cooling within the walk-in, and not introduce any heat from the floor (especially if the floor is concrete). Not all floors necessarily look the same, and your walk-in’s floor can have different finishes available. They’re also insulated (to a certain point) to accommodate temperature retention and traffic. While walk-in coolers or walk-in refrigerators can probably sneak by with at least a thermal breaks on the walls, freezers without a floor is usually not an option (otherwise you’ll cause problems with the concrete below). If you’re not sure if you need a floor or not, then it’s a safe bet to buy one that has a floor. It may be a step up, but to minimize stress it might just be worth it. 4. Make it a Combo? Depending on the size of your restaurant or store, you may want to do both a walk-in freezer AND a walk-in fridge. Sometimes, you could put a walk-in freezer within a cooler (useful for high-volume food prep), possibly saving energy costs in the long-term. But again, every restaurant has different requirements. If you’re just doing a mom’n’pop down the street, you probably won’t have the space to do that. But if you’re doing a hotel restaurant or a large chain, this might be necessary. Accessorizing might be the last thing you’re thinking about when you’re getting a walk-in unit. For easier access between fridges and freezers, you might want to install strip curtains. While these sound silly at first, they are possibly very important for your walk-in because it allows simple enter and exit between the coolers and the freezers, and provide insulation at the same time. Or perhaps you want a rain roof, especially if your walk-in extends beyond your restaurant? Again, this all depends on how your walk-in will be used, so act accordingly. Ultimately, it can either be the biggest investment in terms of restaurant equipment or the most important (sometimes, both). So being knowledgeablee about large-volume refrigeration is important. But at the same time, this guide isn’t comprehensive. If you want even more info, or interested in the quick-ship options on our walk-in cooler/freezer offerings at the frog, either visit us at 2416 Sand Lake Road or call us at (407) 480-3409.